The Financials Integration page allows you to connect Arena with your Financials. After setting up the connection, you can map Funds, Users, and Projects. 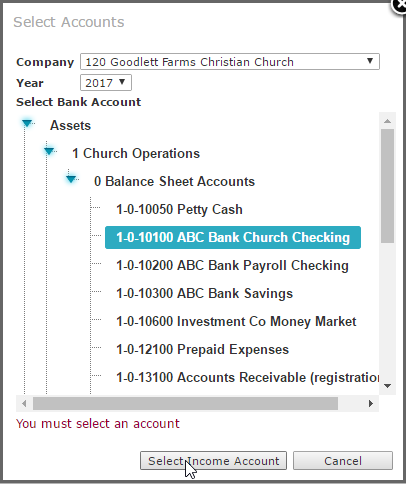 The following fields allow you to setup the Financials Integration connection. 1. 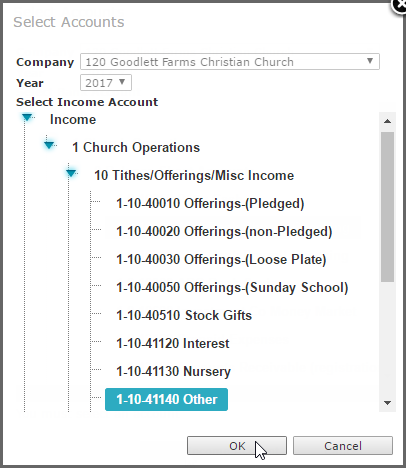 Enable Financial Integration: Check this box to display the options on the Financials Integration page. 2. After clicking the Enable Financial Integration check box, you have the following options available. •Financials URL: Enter the web address for your on-line financials site. •API Key: Enter the API Key. •API Secret: Enter the API Secret. •Test Connection: Click the Test Connection button to test the connection from Arena to your on-line financials database. 3. Click the button after a successful test connection to retain the settings for this page. The Funds tab allows you to connect a fund in Arena with a bank account and an income account in the Financials. This connection is used when exporting contribution batches to be imported into the Financials as journal entries. Follow the steps below to map an Arena fund to the Financials. 1. Click the Map New Fund button. 2. Select a Fund from the drop-down listing. 4. The Select Accounts window appears. Select the Company and Year from the drop-down lists and then navigate to your bank account using the tree-view selector. Click on your bank account and then click the Select Income Account button to continue. 5. Navigate to your income account for this fund using the tree-view selector. Click on your income account and then click the OK button. 6. Review the selections and then click the Insert icon. 7. After a Fund has been mapped, you can modify or delete the mapping. •Click the Edit icon to modify the mapping. •Click the Delete icon to remove the mapping. The Users tab allows you to connect an Arena user with a Financial user so that the Arena user inherits account rights from the Financial User. This is useful for when you are mapping an Arena fund to accounts in the Financials. Follow the steps below to connect an Arena user to a Financials user. 1. Click the Map New User button. 3. The Person Search window appears. Select a search criteria from the drop-down list. 4. Enter your search criteria and then click the Search button. 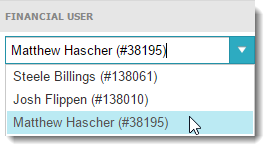 After the names appear, select a name and then click the OK button. 5. Select a Financial User from the drop-down list. 7. After a User has been mapped, you can modify or delete the mapping. The Projects tab allows you to connect an Arena project to a Financials project. When a batch is exported from Arena, the projects that are assigned to funds are added to the detail lines of the journal. Follow the steps below to connect an Arena project to a Financials project. 1. Click the Map New Project button. 2. Select an Arena Project from the drop-down listing. 3. Click the Search button to select a Financial Project. 4. The Pick Financials Project window appears. Select the Company and corresponding Project from the drop-down lists and then click the OK button. 5. Review the selections and then click the Insert icon. 6. After a Project has been mapped, you can modify or delete the mapping.